Go travel the world, they said. It’ll be fun! To be honest, travelling with twin babies isn’t so much fun after all, but rather a huge logistical mission. The amount of bags you have to take and the ear-piercing volumes you’ll experience rivals those on AC/DC’s latest world tour. And the accumulated sleep deprivation can make you feel like you’re having one long hangover! But seeing their granny’s face when she got to finally meet our girls was worth all the stress and strain. We travelled from New Zealand to the UK, then onto Germany and back, and we’ve learned many things that I’d like to share. Before they turn two years old children can fly for free (apart from taxes and fees). But this also means that the bundles of joy won’t have their own seats and will have to share yours. It it possible to book a seat for them and bring your car seat to put them in, but that also means you’ll have to buy a ticket for them. Most airlines have bassinets for babies to sleep in that attach to the wall on the bulkhead (at the front of each section of the plane). Each airline has slightly different types and sizes of bassinets, so before you book make sure that your babies will still fit when you travel. Sometimes it’s hard to predict their growth. When we booked, our two girls were wee three months old premmies, still hanging out under the 25th percentile. But by the time we left they were huge 95th percentile whoppers bursting out of the bassinets. Some airlines, allow you to book bassinets for a fee. Others have a policy that the youngest babies on the flight will get them. If this is the case then you should still let the airline know that you’d like to request some when you’re booking which is what we did. It doesn’t hurt to call the airline again a week before departure and also 72 hours before you leave to confirm you have the bassinets. And be at the airport at least three hours early just in case there are any problems. If we did it again we’d likely go for an airline where you can book and pay for the bassinets which would take away a lot hassles. Even if you don’t think your babies will actually sleep in the bassinets it still makes sense to book them. The bulkhead seats where they are installed have a lot more room and the cots can be used to put bits and bobs that you’ll need on the flight in – bottles, food, toys etc. If possible book an overnight flight. There is the possibility that your two will keep the whole plane awake all night, but there’s also the chance that they will sleep peacefully the majority of the time in their bassinets while you watch a movie or have a nap. Be aware that most airlines make you get your babies out of the bassinets the moment the seatbelt sign comes on. On some of our flights the sign was on for hours so our babies eventually slept on us and not in the little cots. Flying with two babies limits the choice of seats that you can sit in because of the number of oxygen masks available in a particular row. Depending on the seat arrangements on the plane you might have to sit either side of an aisle, behind each other, or if the booking goes completely pear-shaped at different ends of the plane. The seats you’re given often comes down to the configuration of the plane. If there are three seats on either side of the plane, then there are normally four oxygen masks. This means the four of you won’t be allowed to sit beside another passenger as you would require five masks. However, you could ask if there’s a chance to get a row with a spare seat. Otherwise you will have to sit across the aisle or behind each other. If there’s a block of four seats in the middle of the plane, there will generally be six oxygen masks available. This means you can sit there as long as there aren’t any other infants already booked in those seats. If you have requested two bassinets you may end up getting the two middle seats in a block of four which makes getting up and out of your seat difficult as you have to squeeze past someone else. On our homeward bound flights we ended up requesting only one bassinet so we could get an aisle seat but still have lots of room. Our girls didn’t really want to sleep in the cots anyway. But if yours are younger it might be worth getting the two beds and deal with the middle seats. If you’re not sure about the configuration of your plane, take a look at Seat Guru. If the airport staff insist that the flight is full and there’s no way they can give you seats next to each other then try your luck with the plane crew. Tell them of your debacle and they’ll generally do their best to shift passengers so you can sit as close together as possible. Often fellow travellers are more than happy to move away from you and your delightful children so that you get a spare seat. 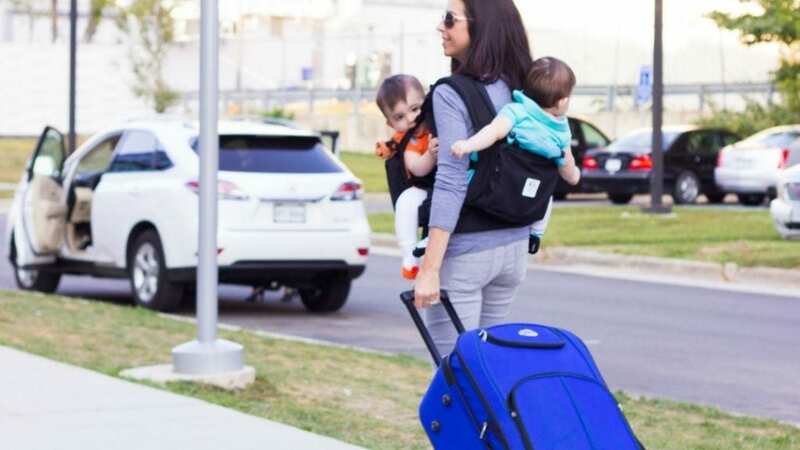 Most airlines will allow you to bring a buggy, car seats and/or travel cots in addition to your normal luggage. Some airlines even allow a piece of luggage for each of the babies. Most of the time they’re also very generous with hand luggage. We always had two biggish pieces and our bulging nappy bag. Be sure to check with your airline though! The main challenge for us was not the baggage allowance but how to transport all this stuff at either end. We always had a trolley piled sky-high with bags, the buggy and a suitcase with wheels but somehow we made it work. 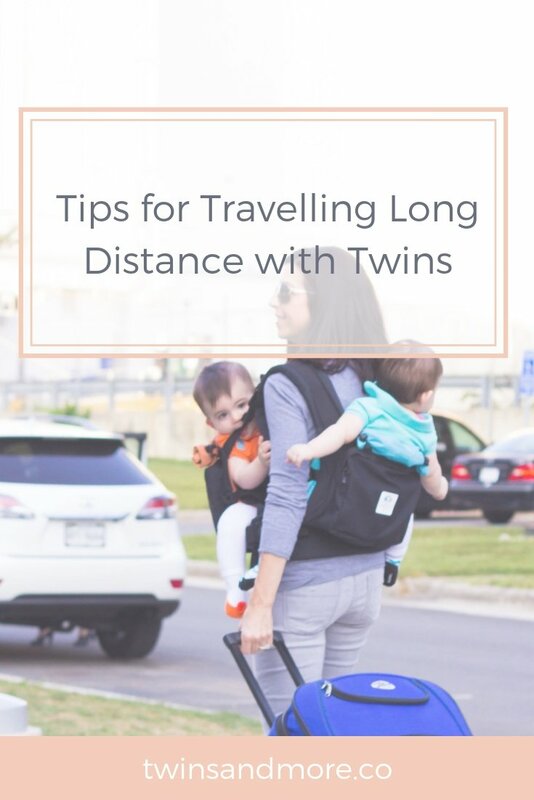 It’s much easier to tackle twin travel as a team, but as you may be separated on the plane be on the safe side and pack two lots of everything into separate bags. We found it helpful to have everything in little freezer bags. Two with food pouches, two with snacks, two with little toys, two lots of nappies, wipes and so on. Airlines are generally pretty generous with baby food and liquids that you want to bring on the flight. Just be prepared for the security check to take a bit longer. It can get very warm and/or pretty cold on a plane so choosing the right clothes for you kids is important. Something light and breathable and either sleeping bags or very warm onesies are a good idea. Depending on the length of your journey, pack enough baby outfits in case there are multiple accidents or your flight is delayed. Also bring along a spare t-shirt for you. Take your buggy right to the gate if you’re allowed to, but this differs from airport to airport. In one airport we had to check our buggy in all the way through to our final destination, so be prepared that you may not have it during a layover. Some airports have (single) strollers you can use but it’s good idea to have front packs so that you have your hands free to carry hand luggage too. Our girls are passionate eaters so packing lots and lots of little snacks and not worrying about overfeeding them on the plane was our secret for success. We also had some of their favourite small toys with us and every hour or so I would pull out a different one to entertain them. Some airlines have a staff member called the “Air Nanny”, supposedly dedicated to helping out with the babies on the flight. In our experience they didn’t do anything except putting up the bassinets. When you settle into your seats, have a look around the plane to see if somebody looks very keen on babies. We had a delightful granny on one of our flights sitting a couple of seats away who was more than happy to hold one of our babies when we went to the loo. Often the airline staff will also help if they’re not too busy. Nobody wants to be the one whose children are crying the entire length of the flight, but if you have multiple flights with multiple babies then the chances are good that one or other of them (or both!) will get so overtired and overwhelmed that they lose it at some point. We tried to tell ourselves not to worry too much about the other passengers but that’s easier said than done. But if it happens it happens, and eventually it will pass. Be prepared to be very tired. 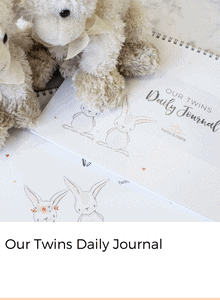 We found the hardest part of travelling with twins wasn’t the flights themselves, but tackling your jet-lag while the babies tackle theirs. It took a couple of days of 3am playtimes and afternoon grumpiness for us to get them into the new time zone. We tried to re-establish our usual routines and timings as much as possible but allowed for some extra naps (for them and us) when needed. On the first day we let our girls sleep as much as they needed to. If one woke up we still let the other one sleep on. After that we got back into our routine of always having them both up at the same time to get them back on one schedule. Our girls have a cow’s milk intolerance and drink soy milk formula. I checked if it was sold in the UK but it didn’t cross my mind that it wouldn’t be available in Germany. In the end we had to fork out hundreds of dollars for hypoallergenic infant formula. So if your babies have some special requirements make sure you know how to get your hands onto their food. Overall, our overseas trip with our girls was great, but travelling with two babies isn’t a leisurely stroll in the park. Be as well prepared as you can and don’t forget to breathe. It’ll be fun. At least in hindsight!